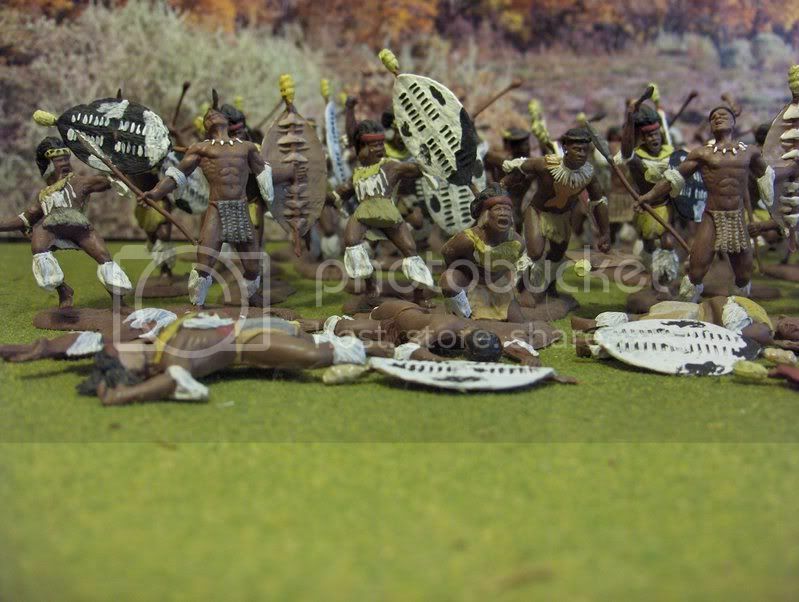 The Zulus caught in a cross fire from both buildings and the back wall the Zulus are halted amid mounting casualties. 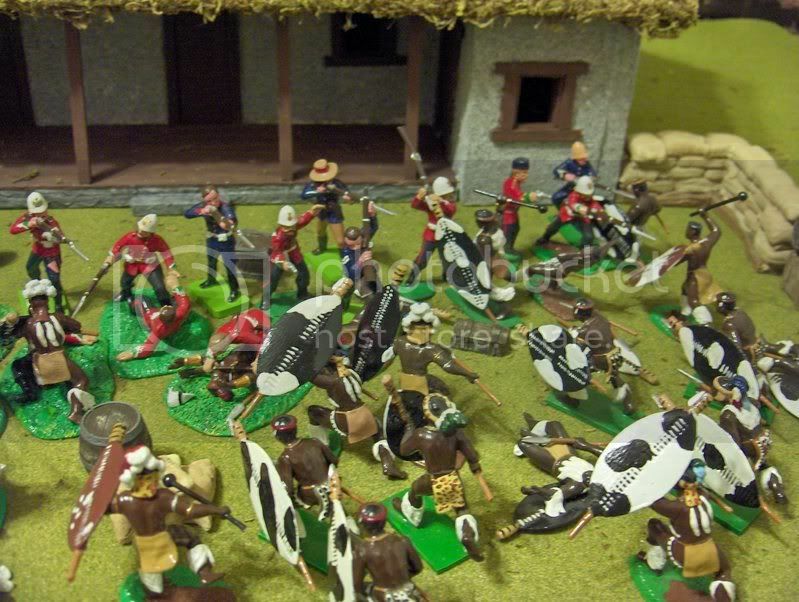 As the first assault comes to a halt. 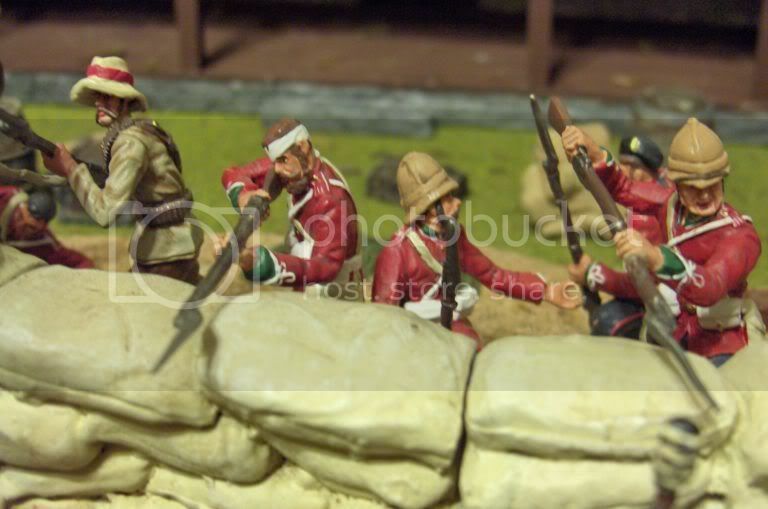 The main boady seeeing the heavy fire coming from the back of the post veer to the left passing the hospital moving to the front of the post. 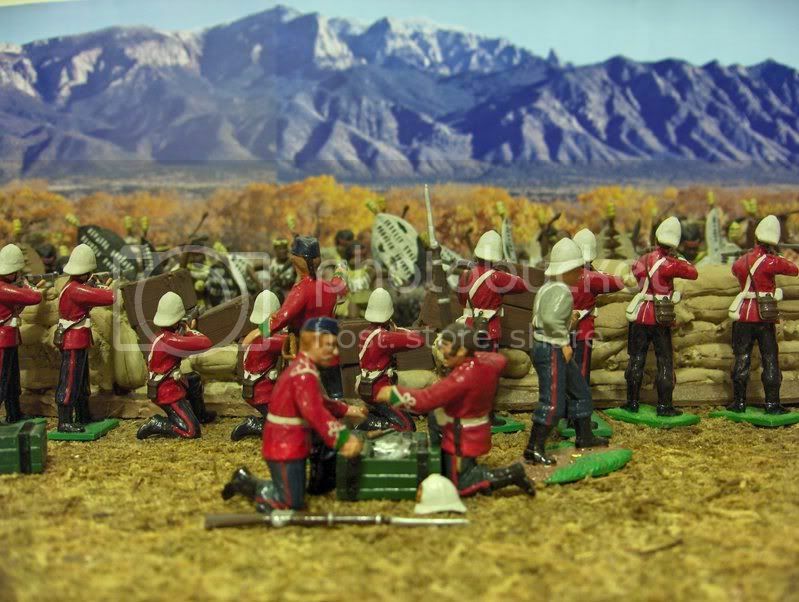 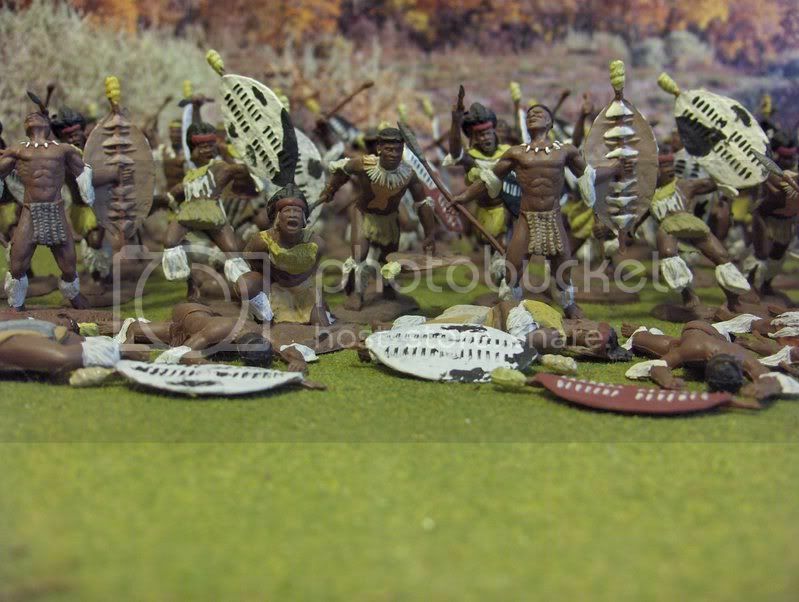 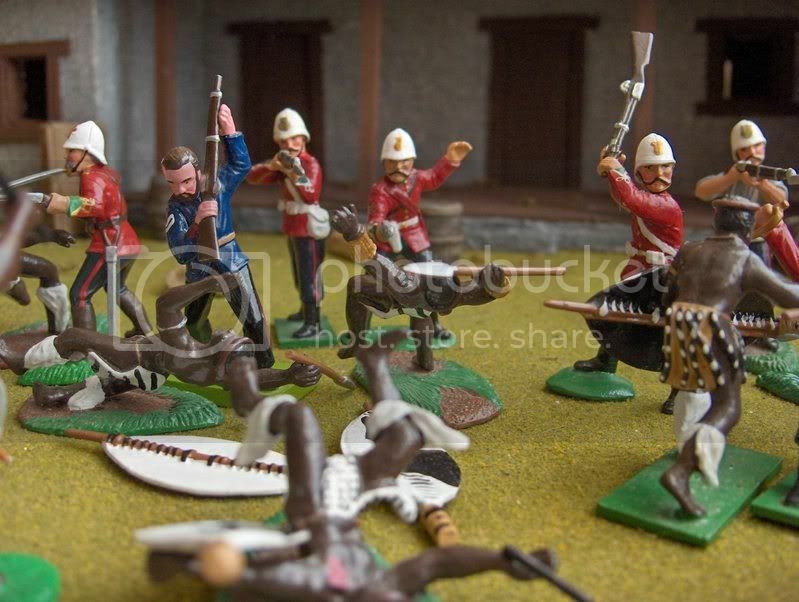 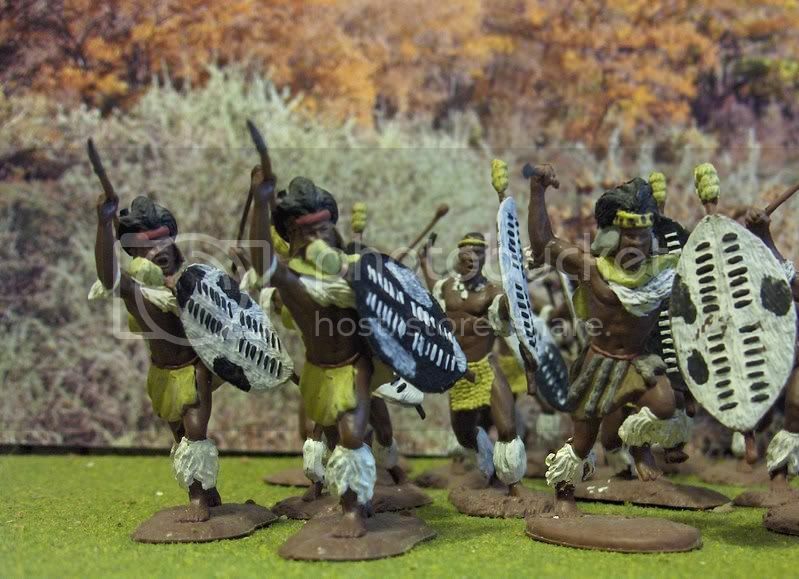 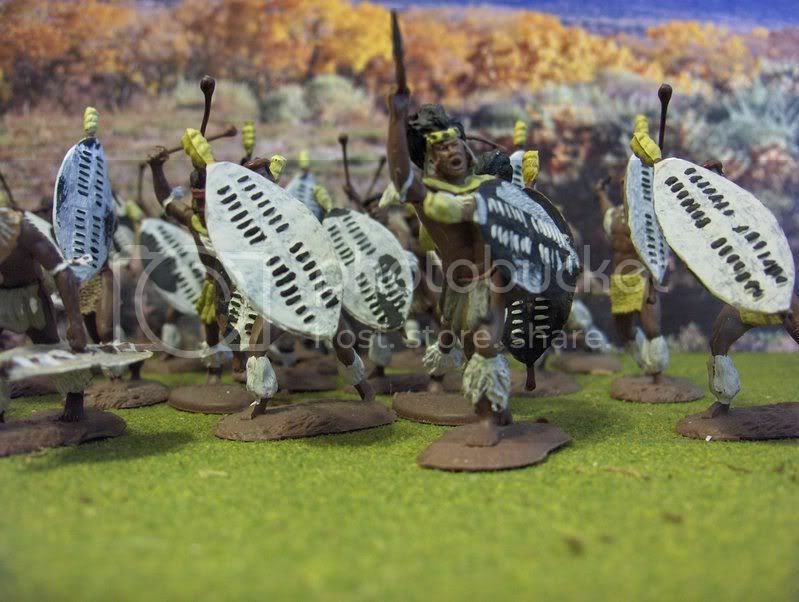 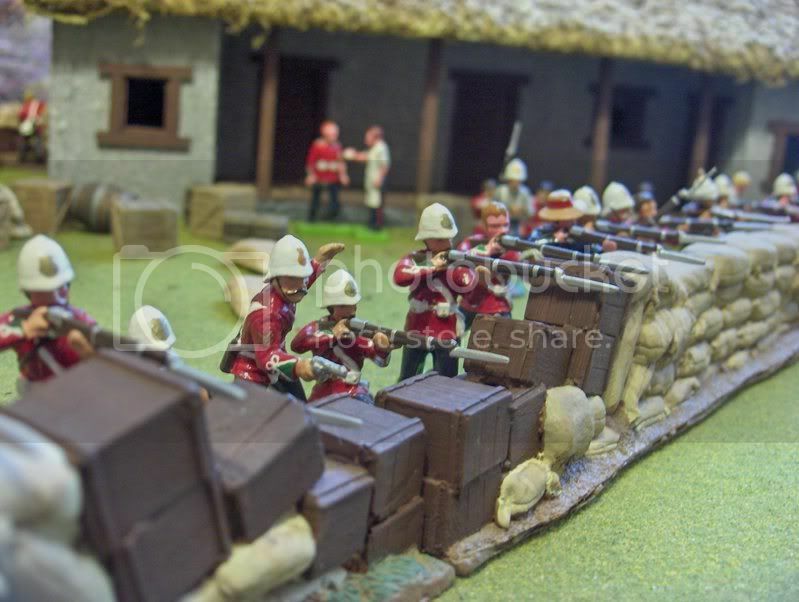 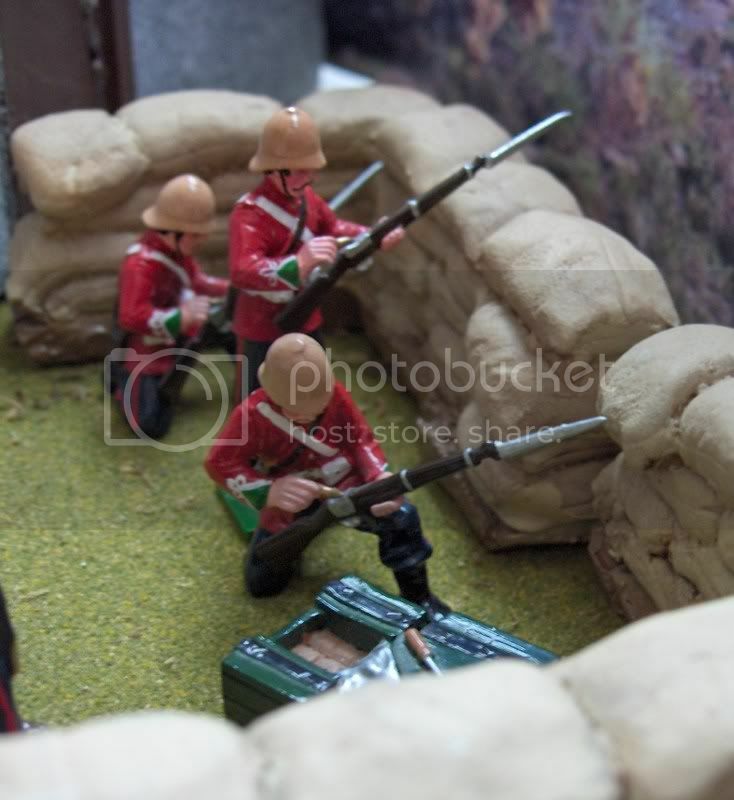 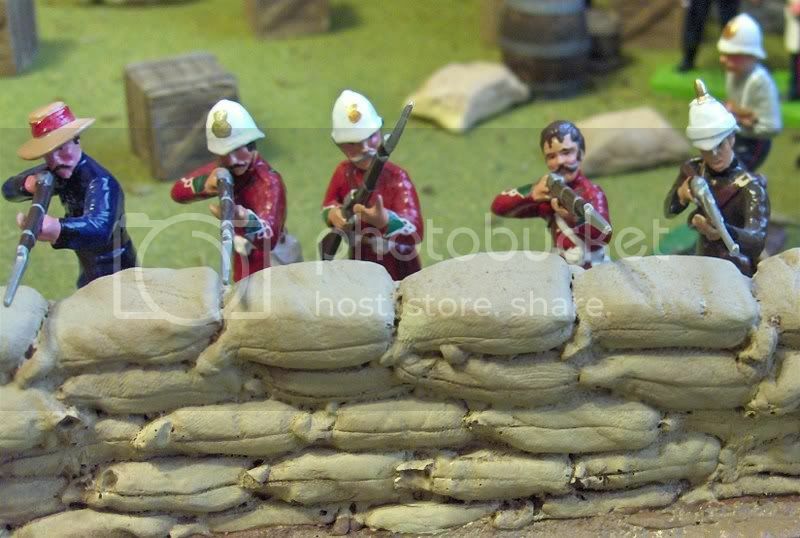 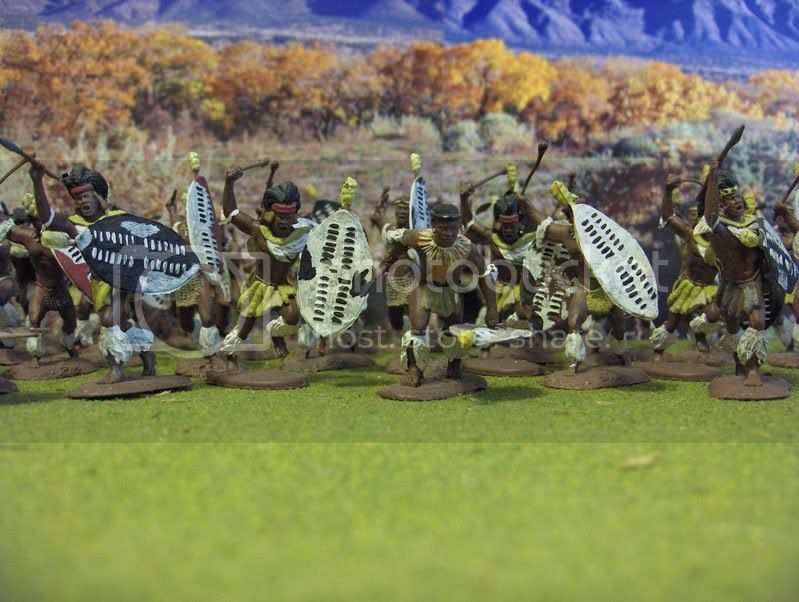 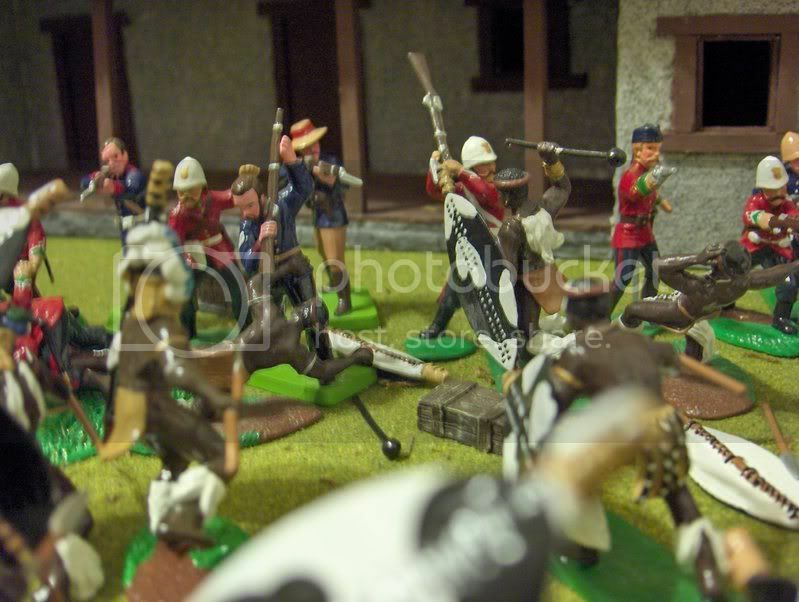 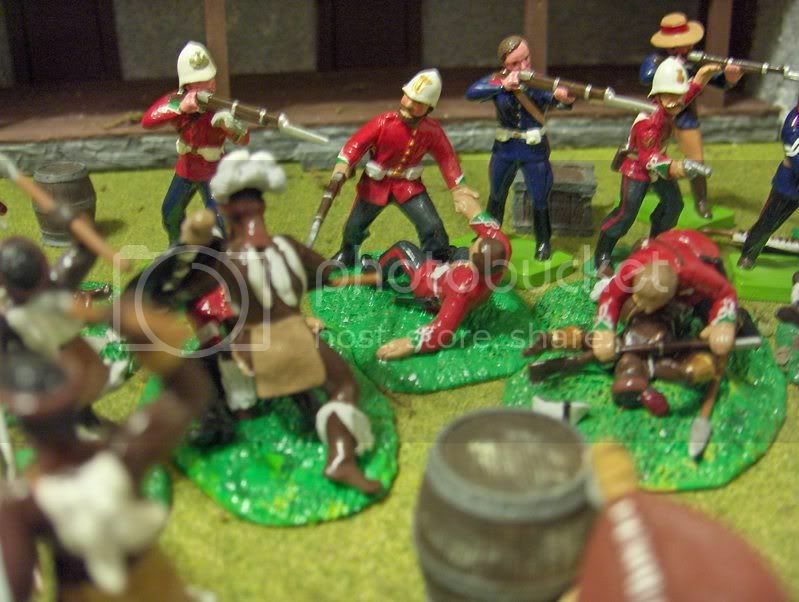 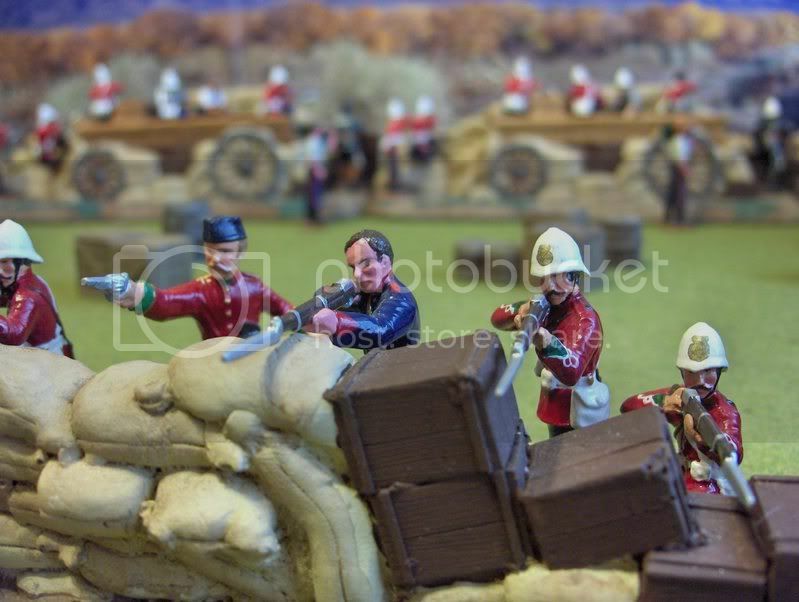 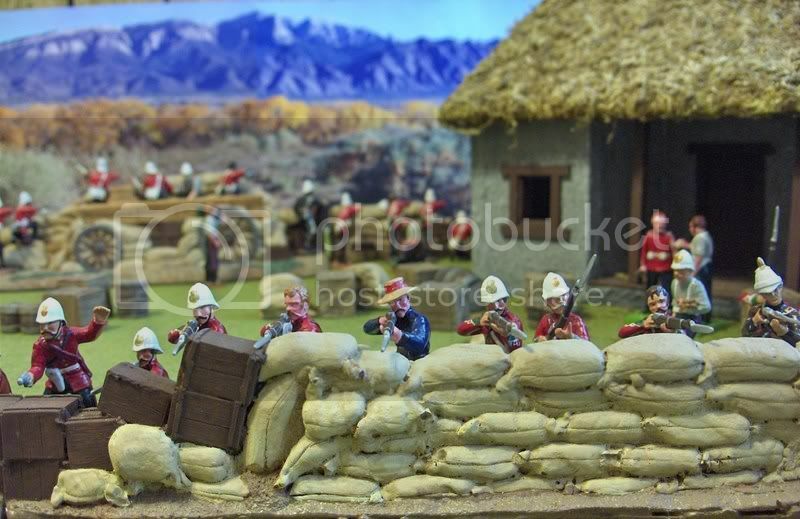 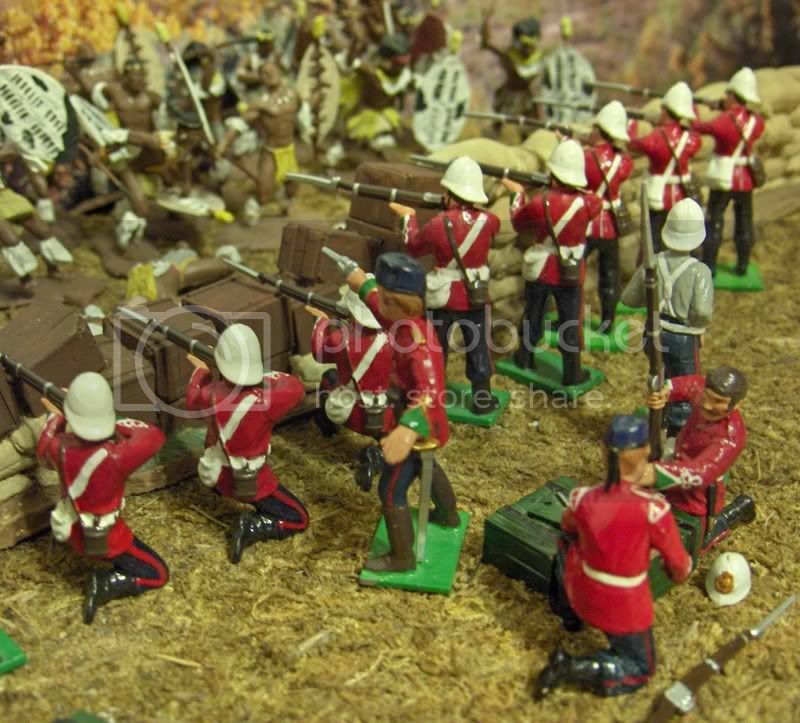 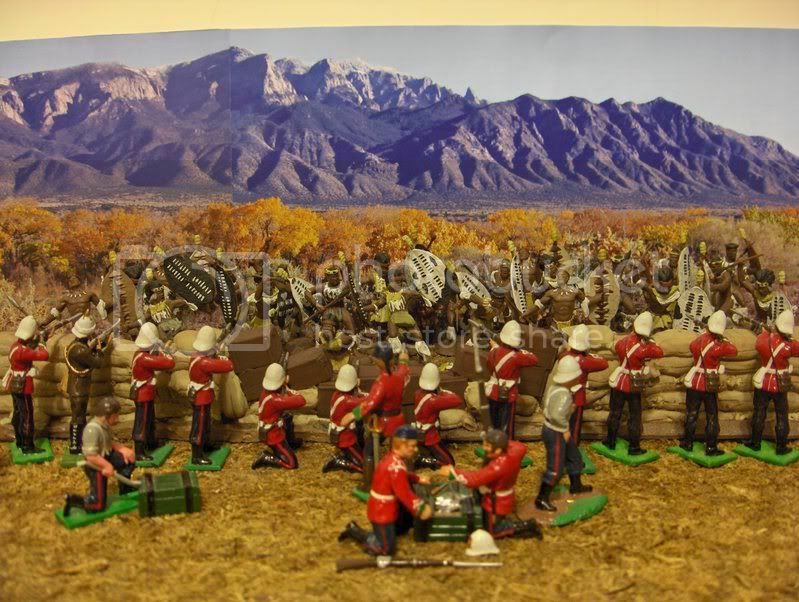 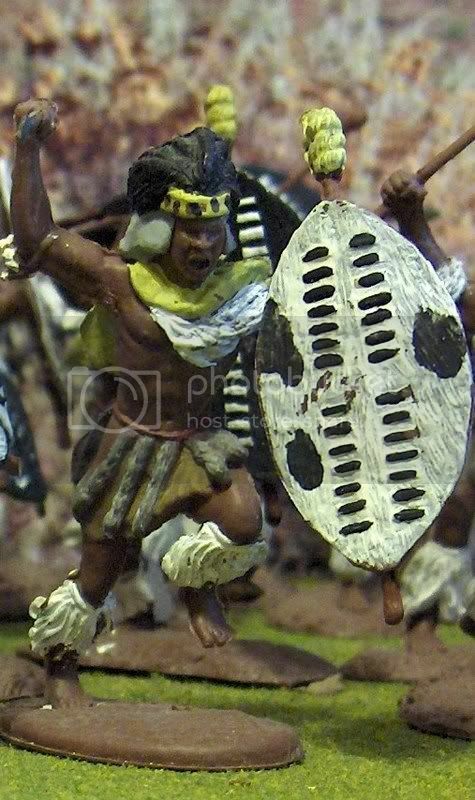 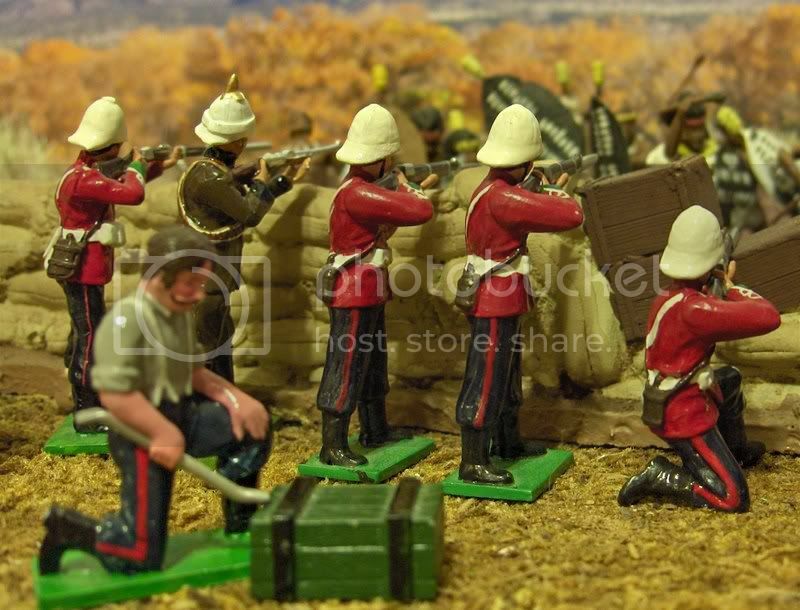 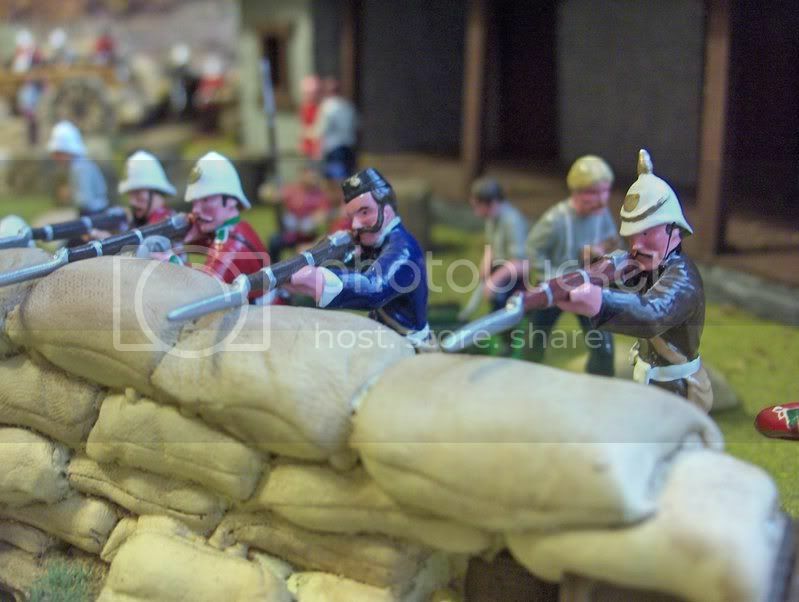 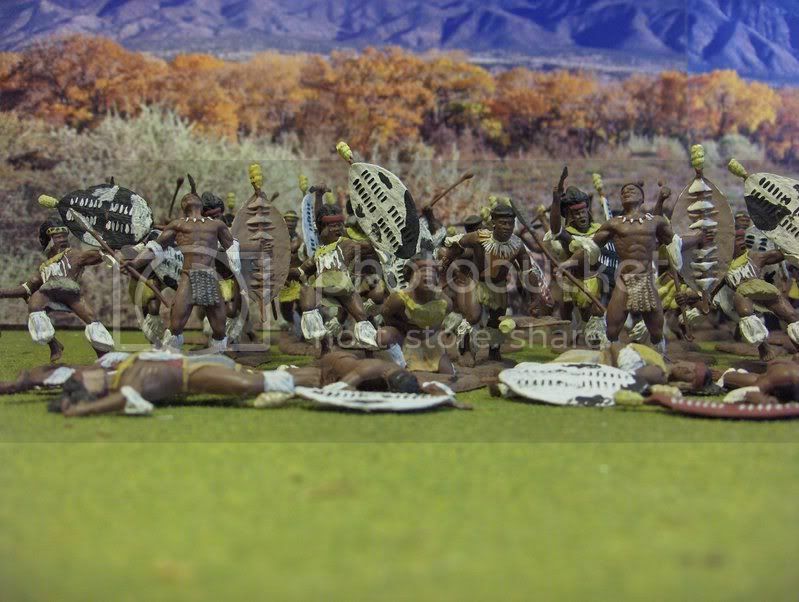 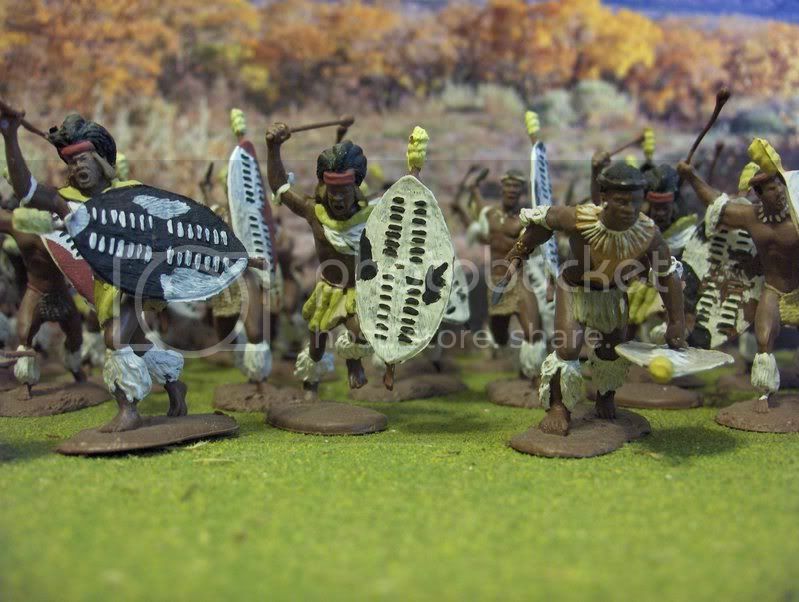 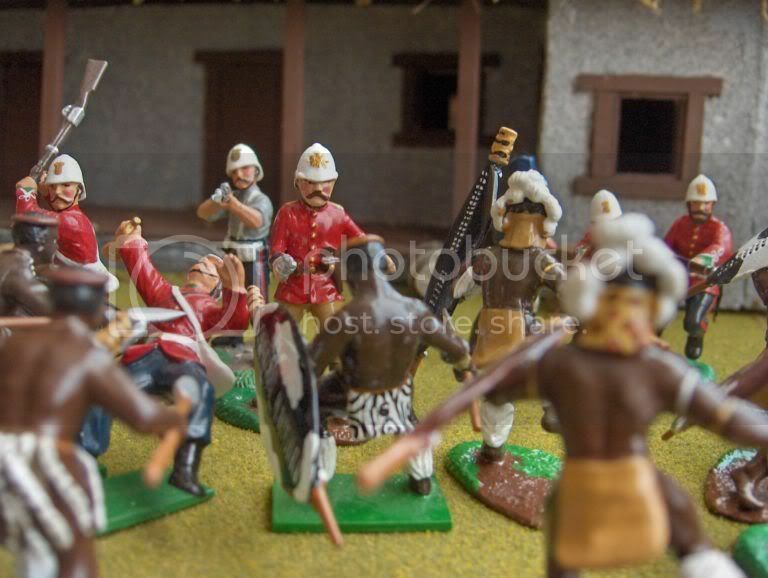 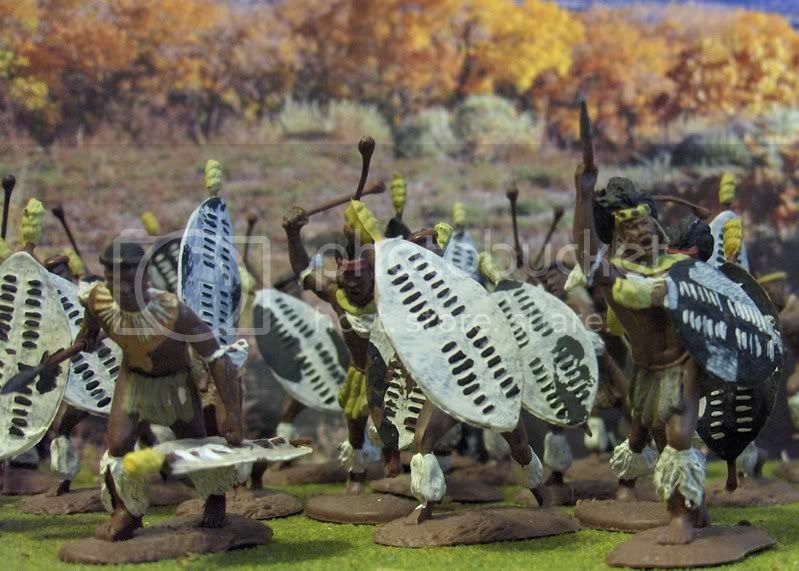 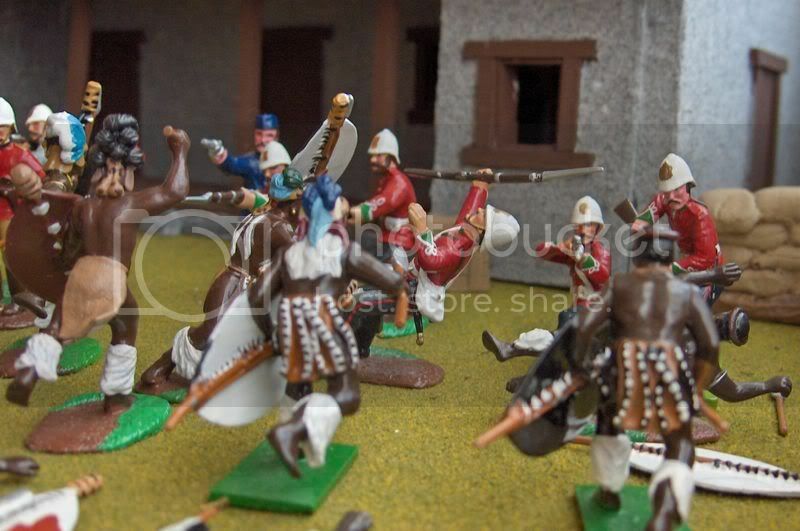 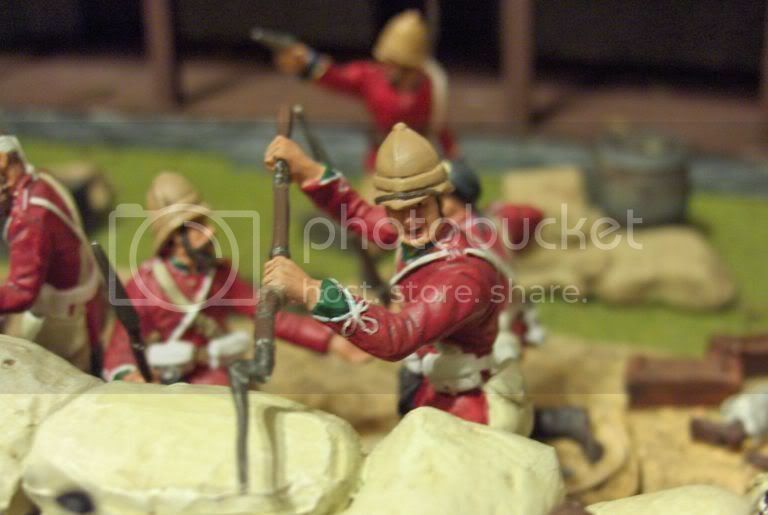 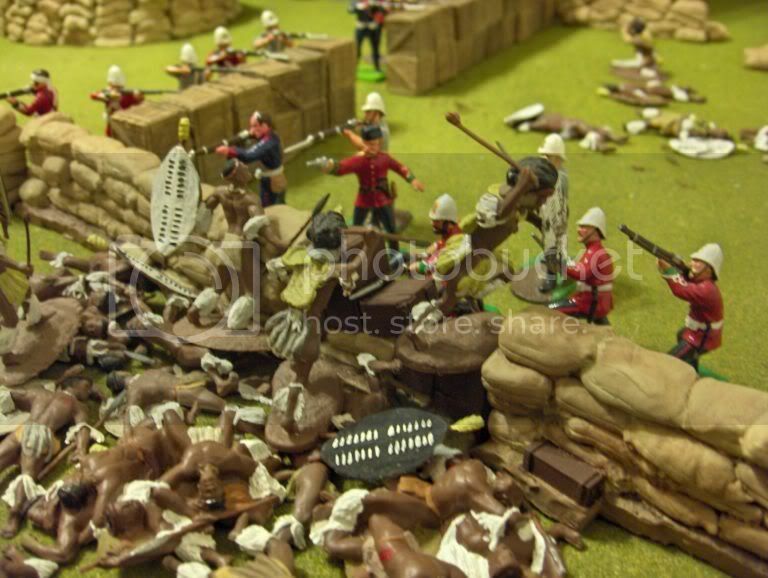 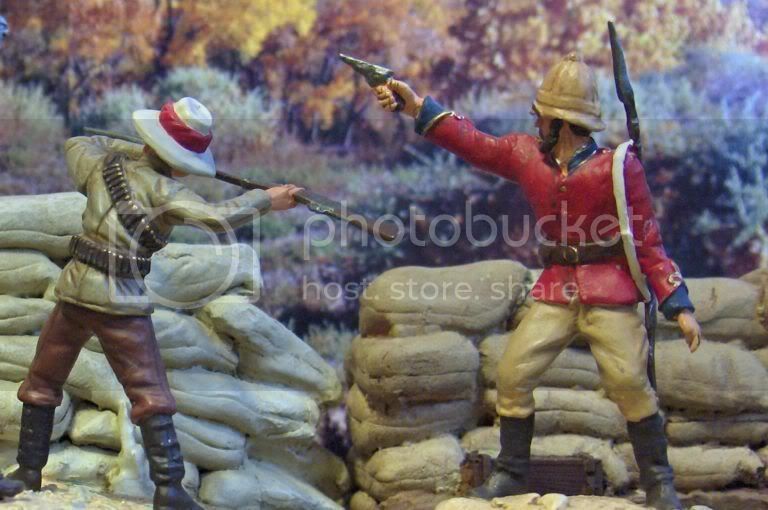 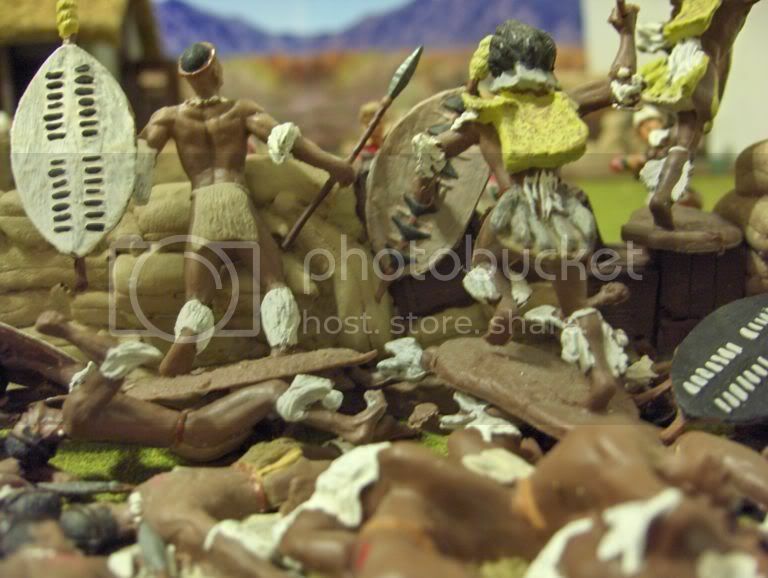 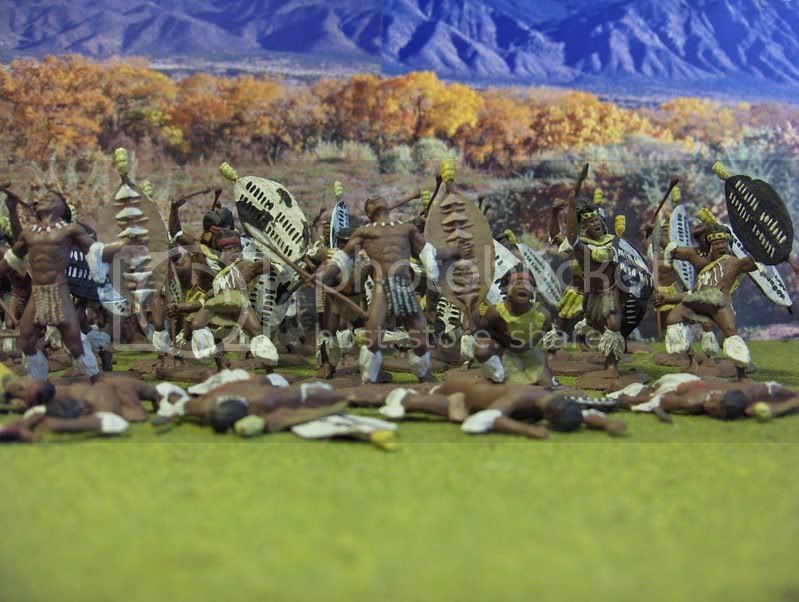 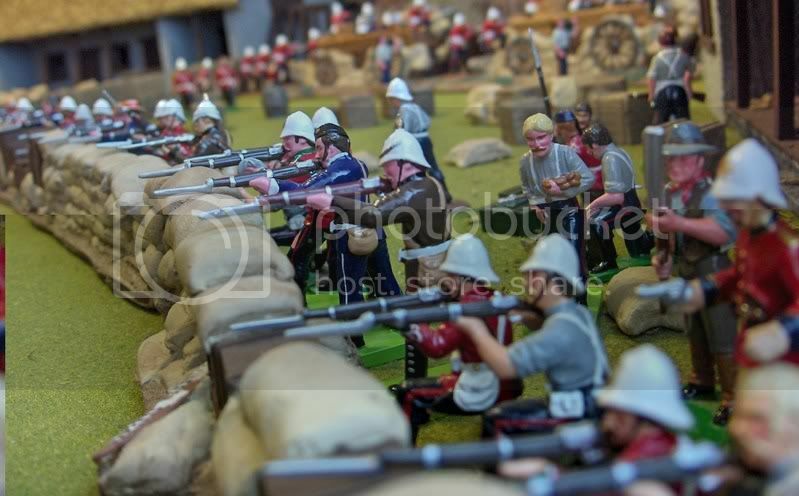 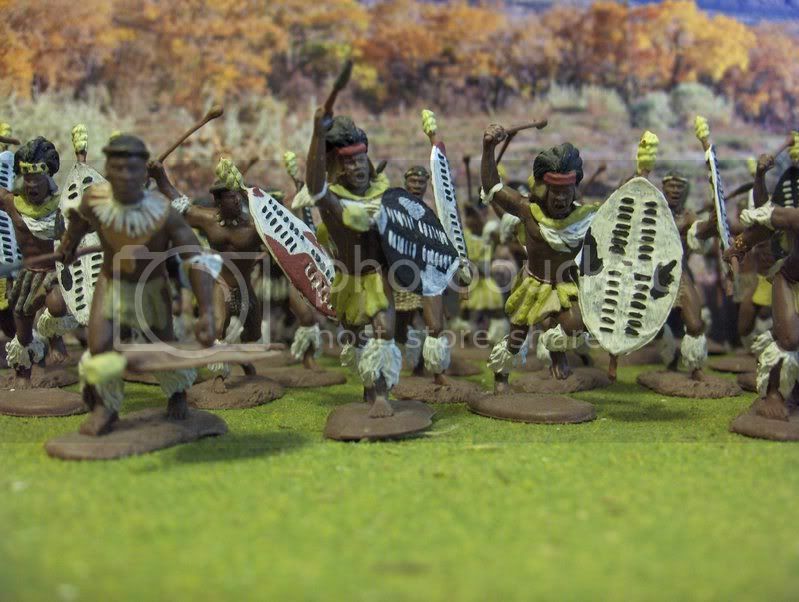 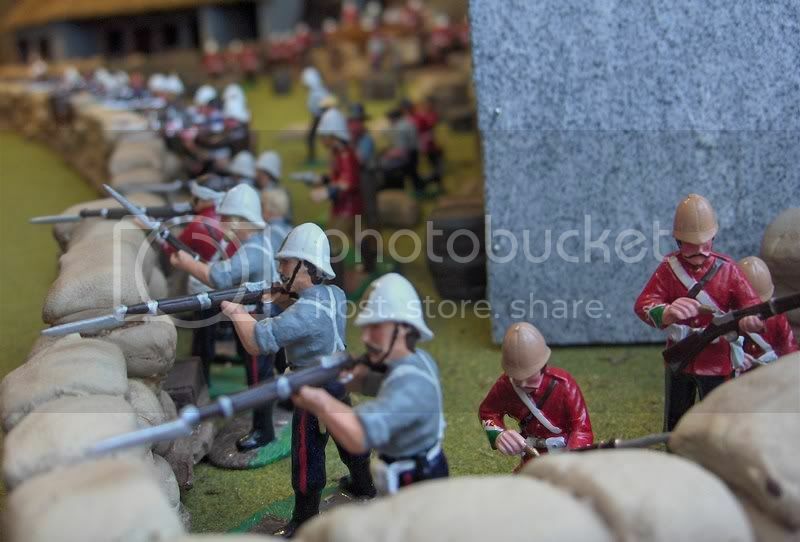 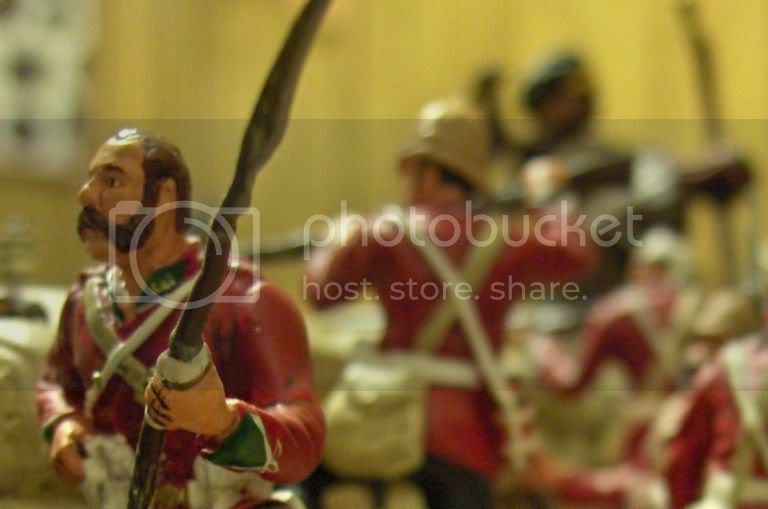 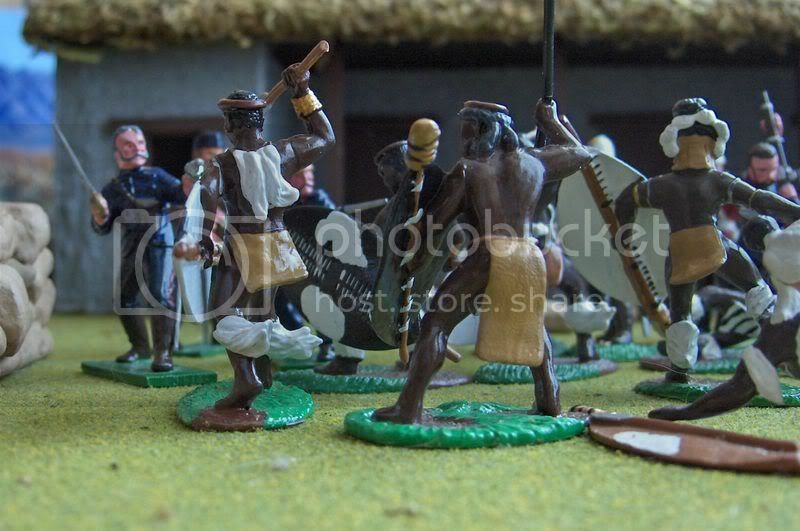 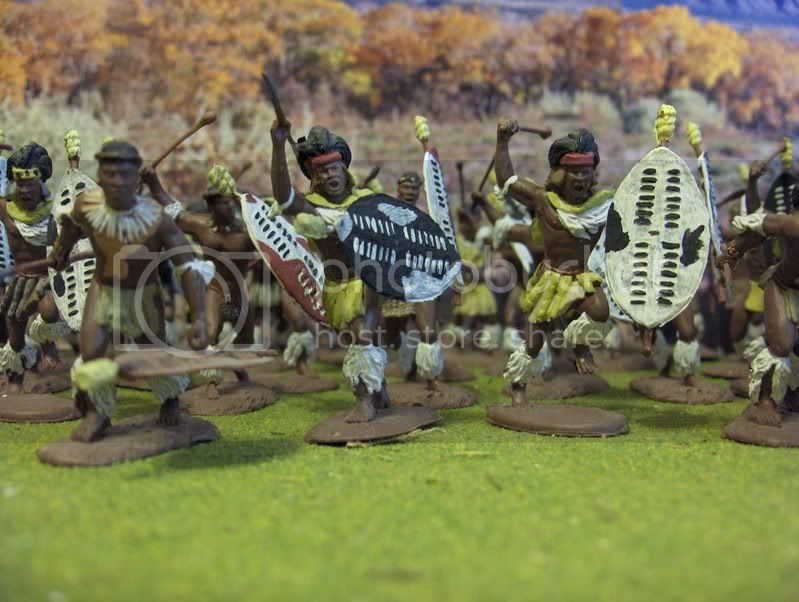 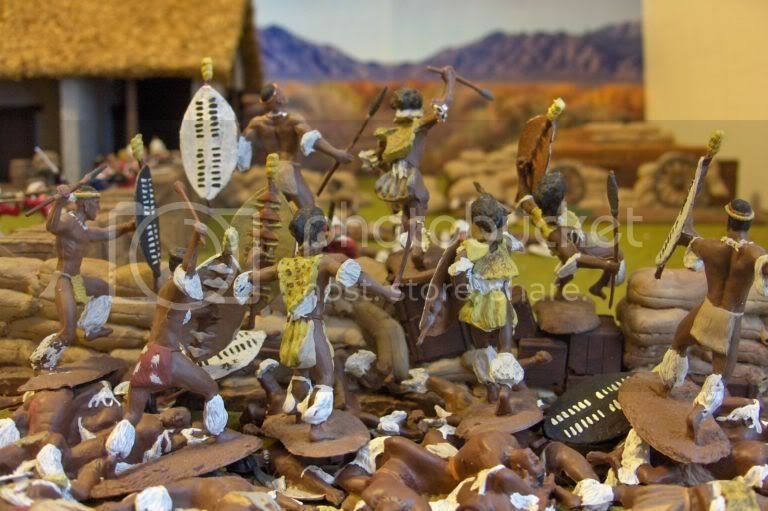 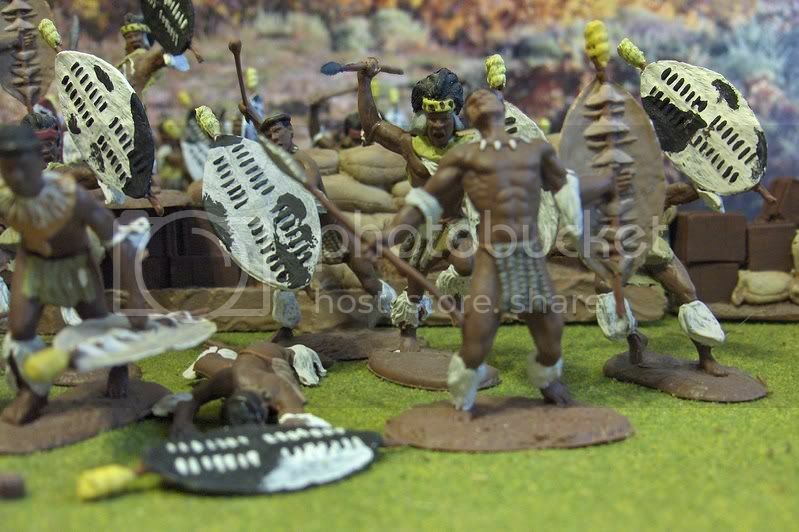 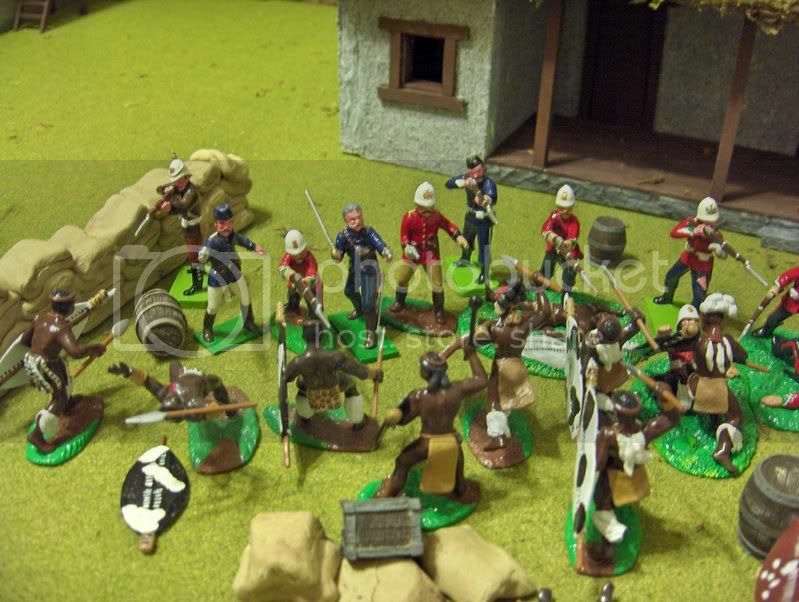 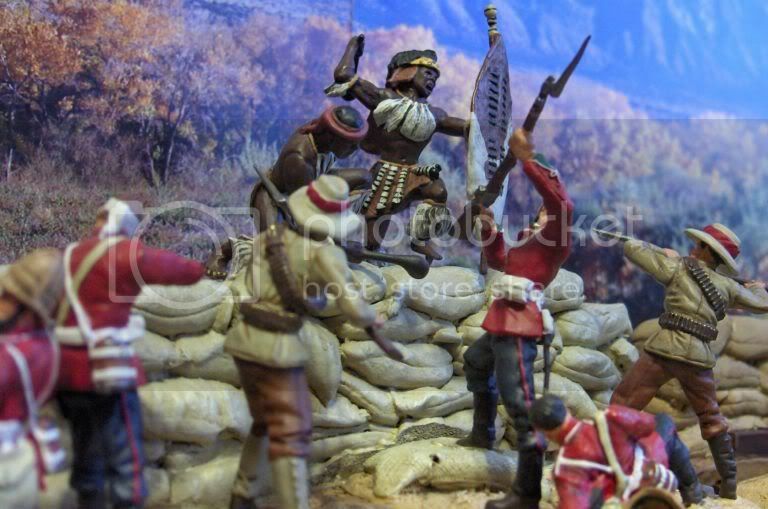 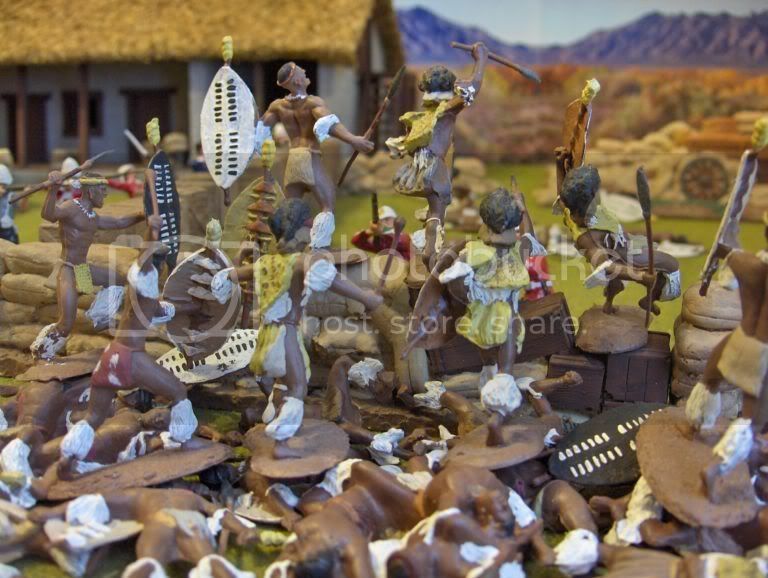 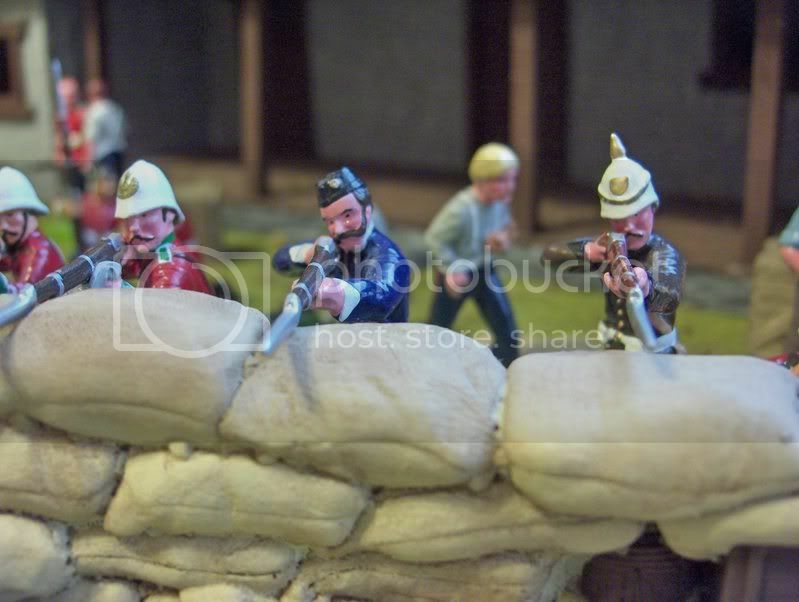 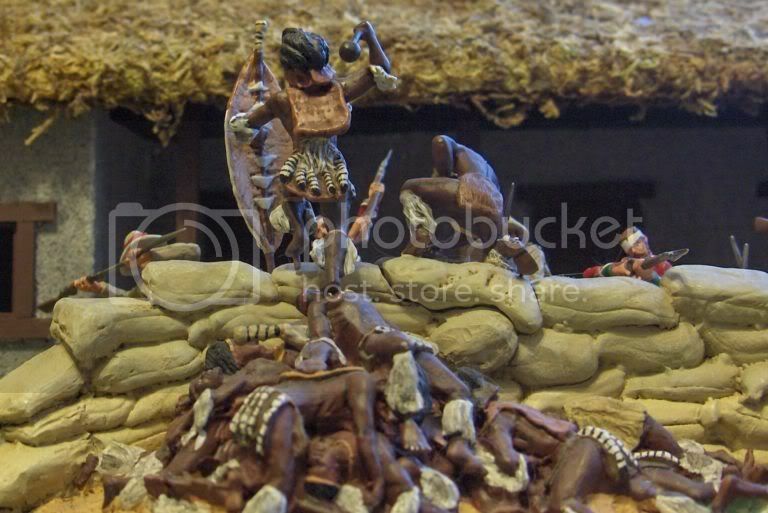 Barely pausing to regroup the INdluyengwe launch the first of a series of attacks against the hospital......The Lt.
Manning the barricade in front of the hospital the defenders given command to fire by Lieutenant Chard begin firing at the approaching Zulus....The Lt. 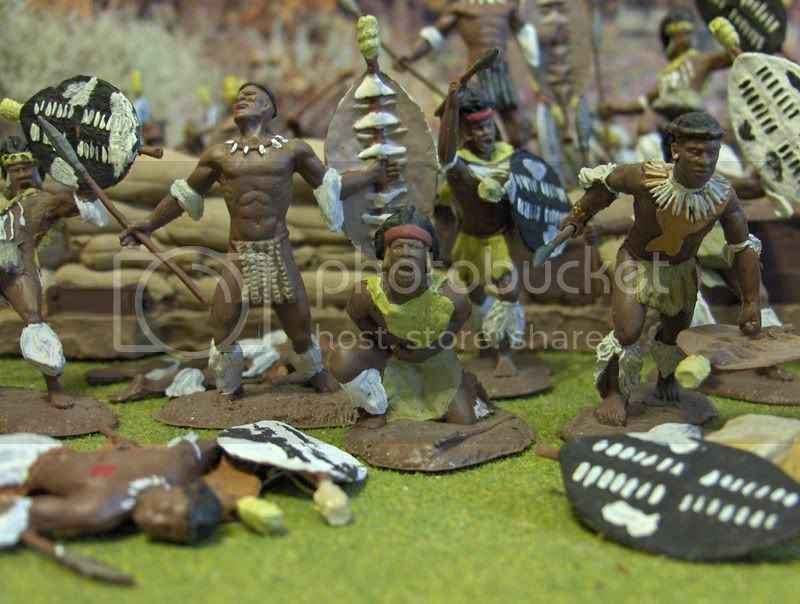 Taking on casualties the Zulus continue their attack and please feel free to add comments........The Lt.
Manning the barricades the defenders continue to deliver Their deadly fire.....The Lt. 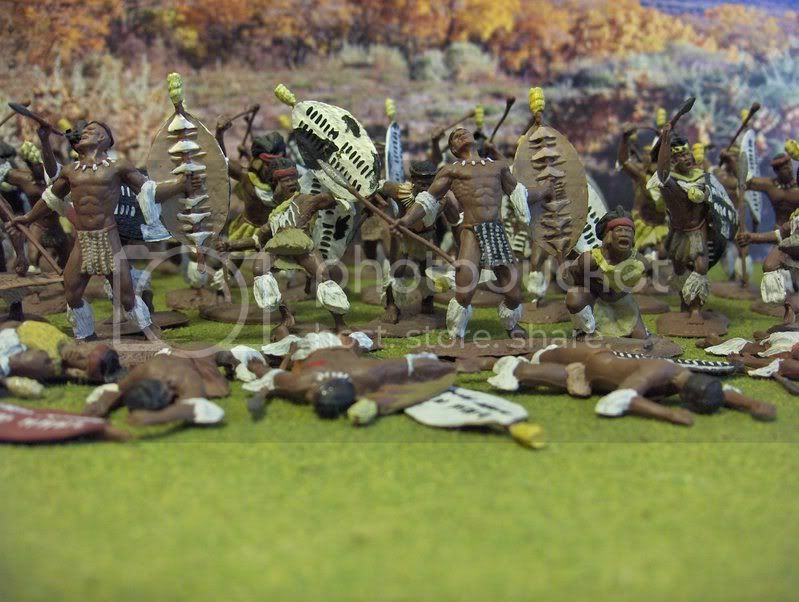 Stepping over their own dead the Zulus continue to press their attack as the defenders select their targets......The Lt. 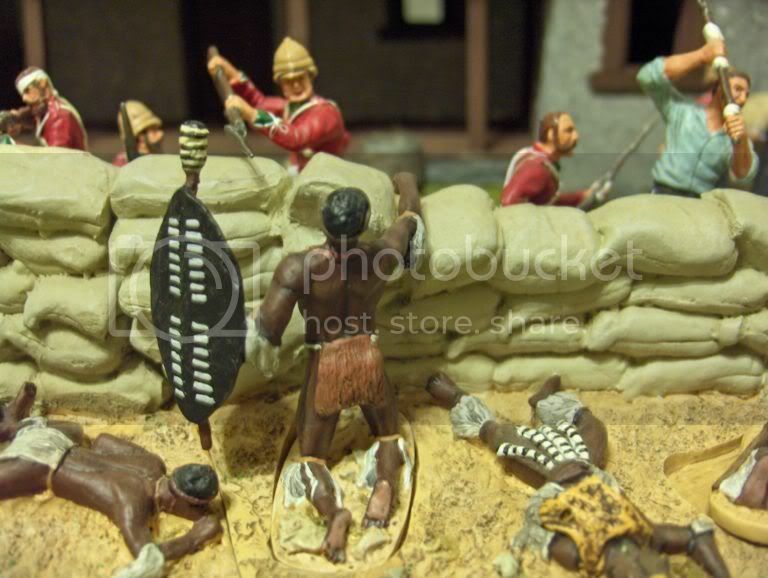 The Zulus assault overuns the weak barricade in front of the Hospital....The Lt. 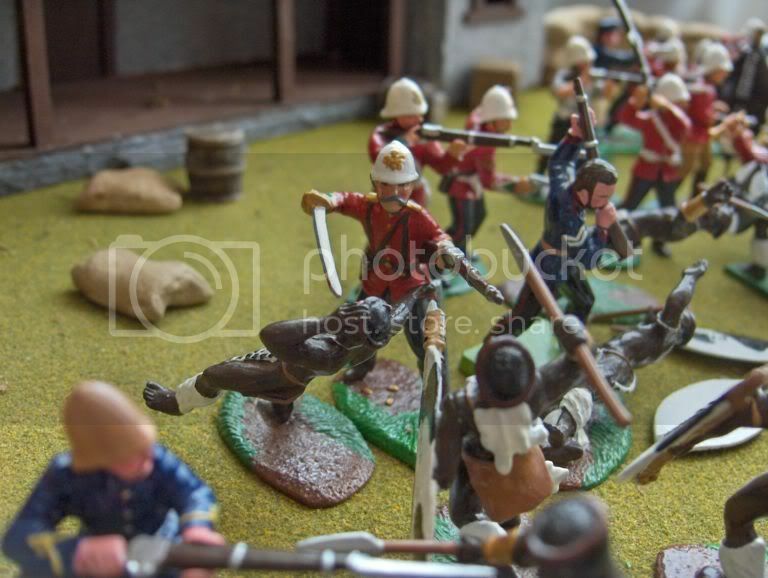 The Zulus are driven back by a bayonet charge lead by Lieutenant Bromhead and Colour-Sergent Bourne joined by Lieutenants Chard and Adendorff along with Commissarys Dalton and Dunne as bayonets versus assegi as the defenders struggle to survive.....The Lt. 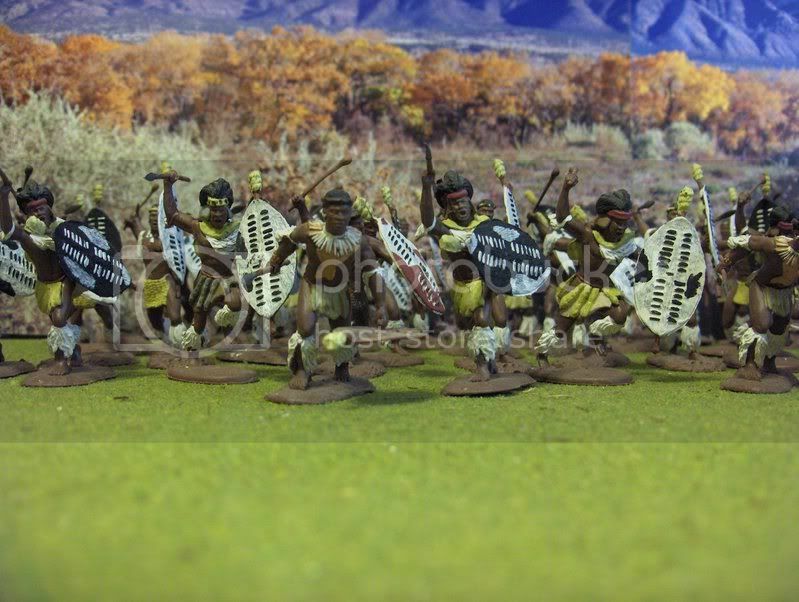 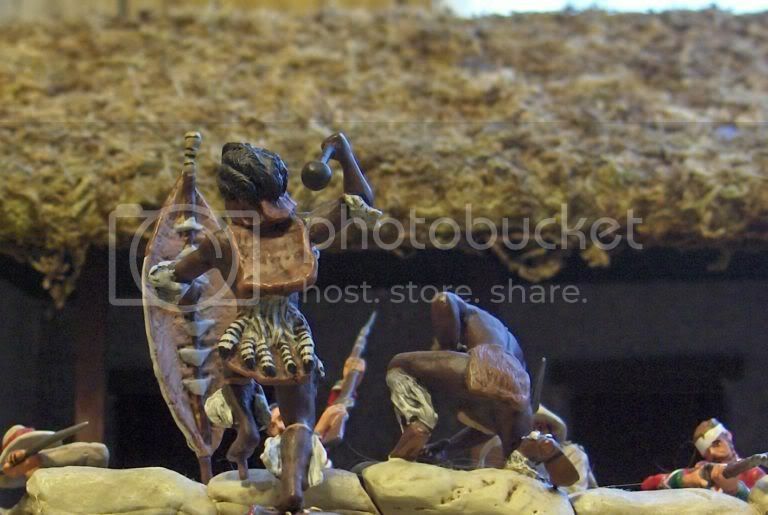 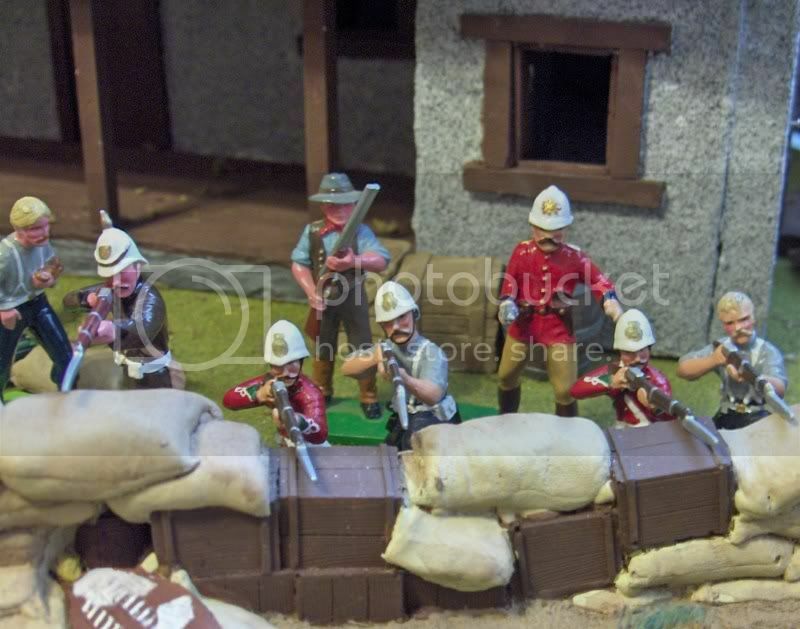 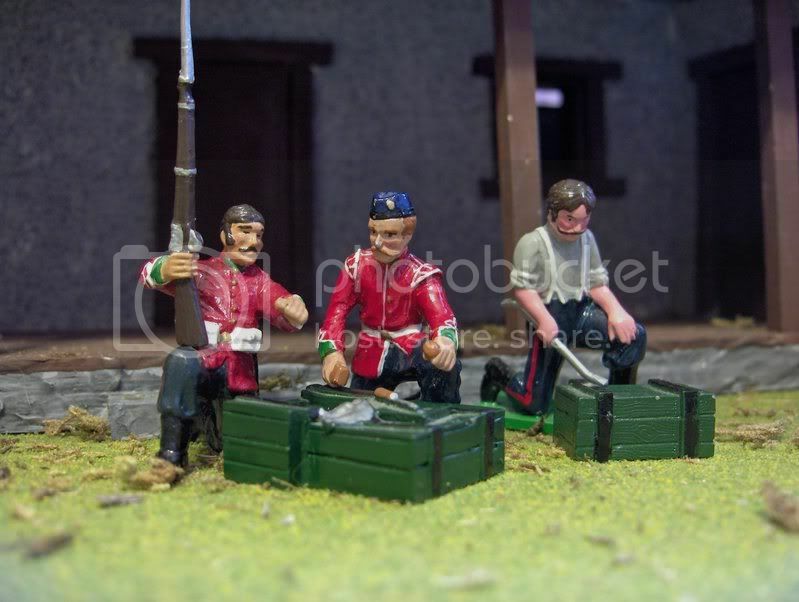 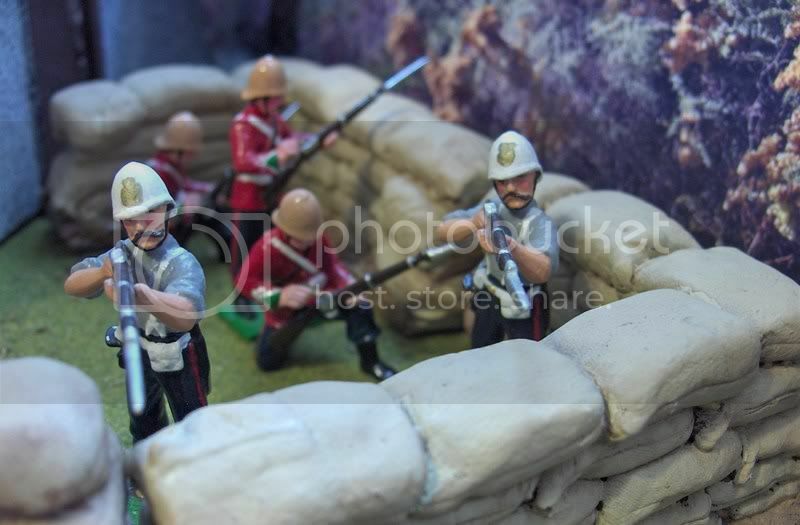 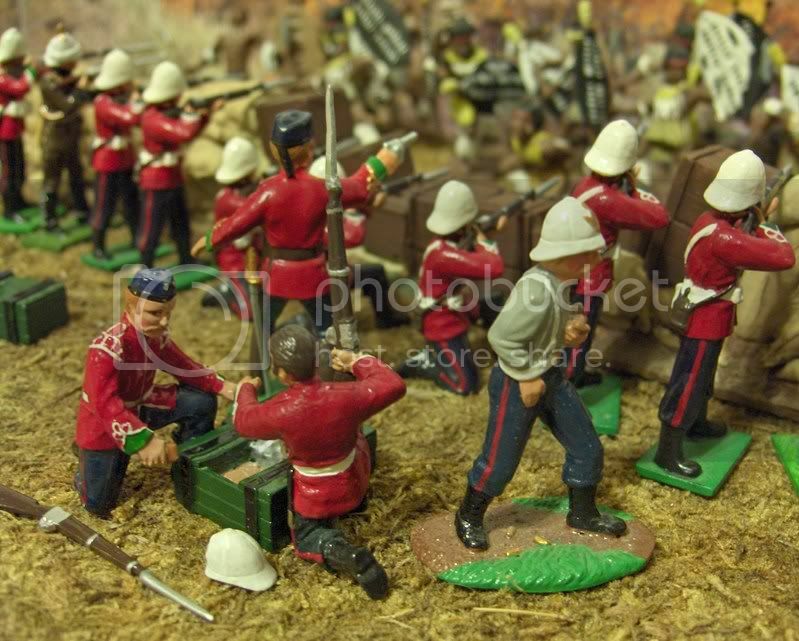 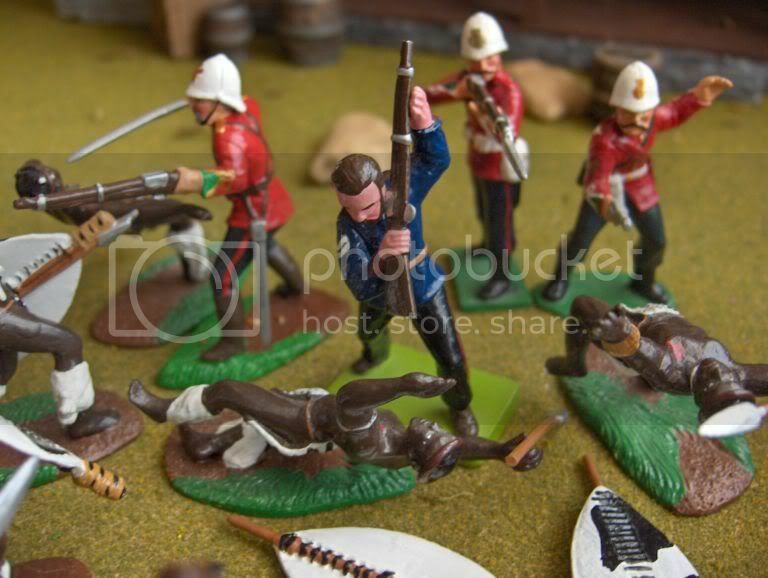 Lieutenant Bromhead dispatches two Zulu Warriors as Commissary Dunne and Lieutenant Chard are also joined in the fighting along with members of B Company......The Lt.
Having driven the Zulus back the defenders prepare for their next assault...The Lt. 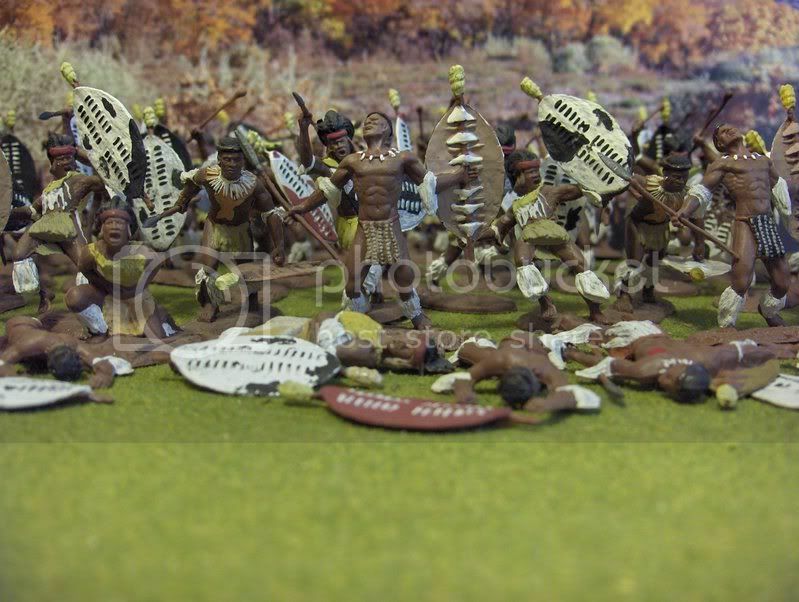 The Zulus once again launch another attack against the hospital climbing over their own dead at the barricade to get at the defenders......The Lt. 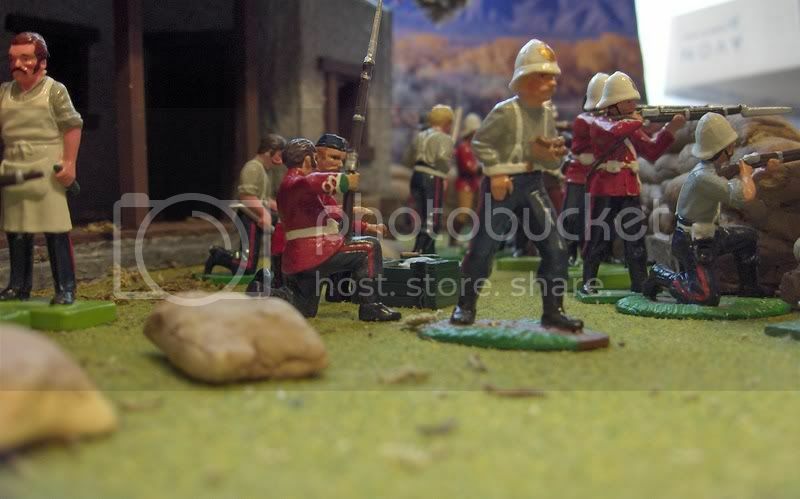 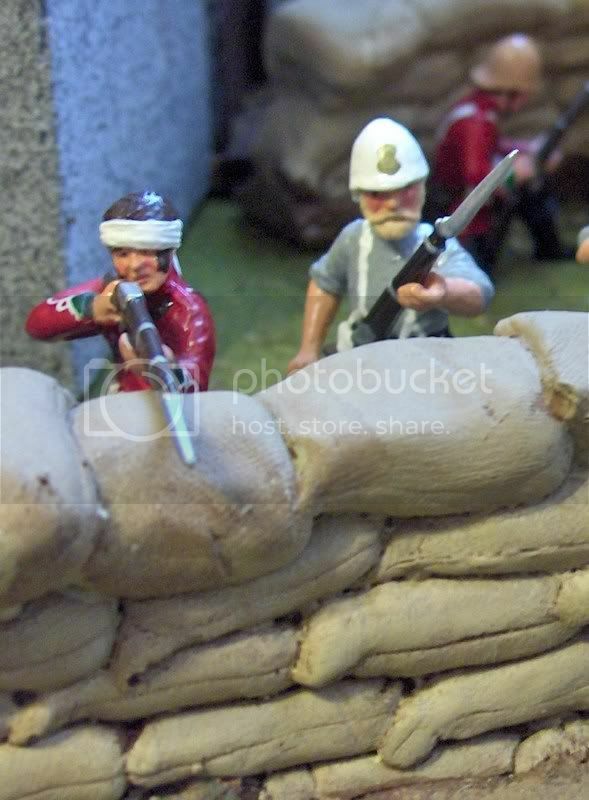 Lieutenant Chard fires his pistol along side members of B Company as private Hitch slides off the roof runs across the compound and takes up a position in front of the hospital......The Lt. 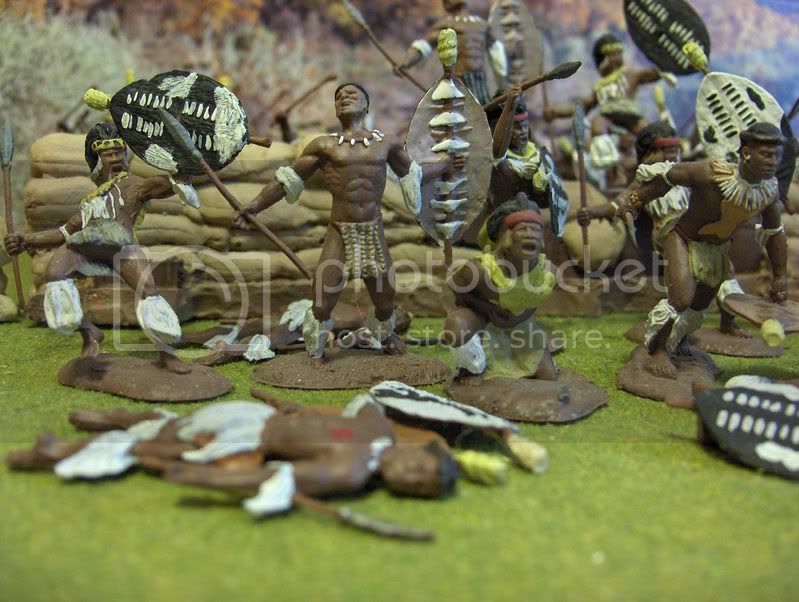 The Zulus determined to get at the defenders climb over their dead to get at them as Brohead with pistol in hand encougages his men as they stem the tide of the assult...The Lt.
After regrouping the uDloko launch another major assualt as Bromhead gives the command to fire.......The Lt.